Foodista | Celebrate Spring with Vietnamese Spring Rolls! 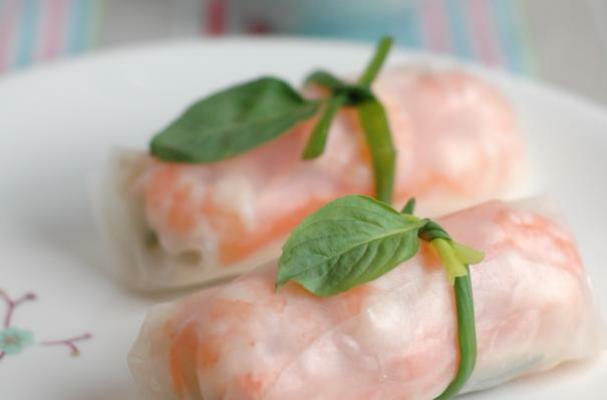 What better way to celebrate Spring than with fresh and delicious Vietnamese Spring Rolls! These healthy rolls from My Cooking Hut are filled with fresh herbs and shrimp then dipped in a sweet and spicy sauce. They're the perfect light lunch or snack! Soak the rice vermicelli in warm water until they turn soft, then drain them. Fill a bowl with warm water. Dip one wrapper at a time into the water for about 1-2 second to soften. Lay the wrapper on a dry chopping board or dinner plate. The rice paper should become pliable within seconds. In a row across the centre, put 3 prawns, some vermicelli, carrots, bean sprouts, and a few leaves of basil. Leaving about 4-5cm on each side. Fold the sides inward, then start to roll tightly and firmly from the end that is near to you into a cylinder, enclosing the filling completely. For the dipping sauce, mix all the ingredients and stir well until the sugar dissolves. Then, put in chopped coriander.